ContraPloy is a two player game. 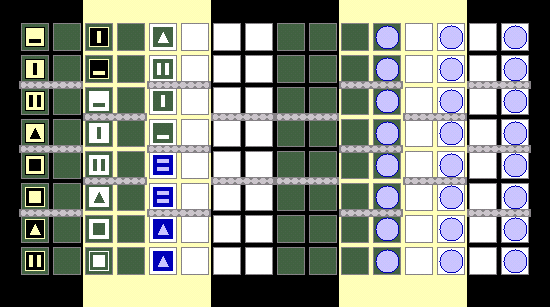 The playing board is comprised of sixteen columns of eight square spaces. Each player has 24 playing pieces. One player plays the square pieces; the other plays the circular pieces. At the beginning of the game, the players arrange their pieces at opposite ends of the board, in every other column. The identity of each piece is hidden from the opposing player. Furthermore, each piece's strength is based on its location on the board. 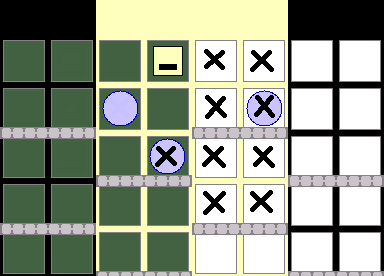 The object of the game is to move a single piece off the opponent's end of the board. He who does so, wins. Failing that, a player who is unable to move due to having no pieces, loses. Players alternate turns. 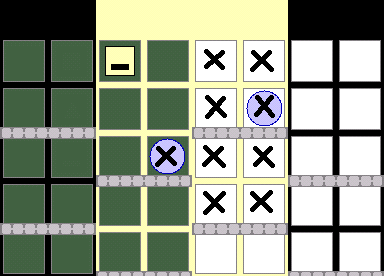 On the first turn, the first player moves one piece. 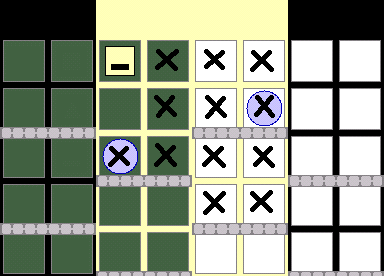 After that, on each turn a player must move two pieces (unless he has only one piece remaining). A piece may move any number and combination of spaces forward, up, and down, with restrictions noted below. Forward is towards the opponent's end of the board. It follows that a piece may not move backwards. The board is divided into eight pairs of columns. Each pair of columns is a zone. A piece may only move within the same zone or into the next zone forward. The gray horizontal bars are barriers. A piece may not move through a barrier. Exception: a blue triangle piece (a ranger) may move through barriers. A piece may jump over any number of friendly or opposing pieces. A piece may not land in a space already occupied by a friendly piece. A piece may land in a space occupied by an opposing piece. This constitutes a "hostile overture." If a piece moves within the same zone, it must either make a hostile overture, or it must move away from an opposing, threatening piece in the same column. (In other words, it must move with a purpose.) Otherwise, it must move into the next zone. The square piece may move forward to any of the spaces marked with an X. Within the same zone, it may make a hostile overture against the opposing piece. Within the same zone, the square piece may make a hostile overture against the opposing piece, or it may move forward one column to avoid it. Even though the square piece is now one space forward, it still may only move within the same zone (though never backwards) or into the next zone. Hostility is resolved as each piece is moved. The piece that is lesser in value is removed from play. If the pieces are equal in value, both pieces are removed. The identity of the defending piece is always revealed. The identity of the aggressing piece is revealed only if it wins or ties; if it loses, its identity remains hidden. The green pieces (elves) are powerful on the green spaces on the board. They are weak everywhere else (that is, on the white spaces). Likewise with the white pieces (accountants) -- they are powerful on white spaces, but weak on green spaces. The black pieces (ninjas) are powerful in the black sections of the board, but weak in the yellow sections. And finally, the yellow pieces (lions) are powerful in the yellow sections of the board, but weak in the black sections. And there are variations. For example, this green piece has a value of 9 (very powerful) on green. But it has a value of 0 (very weak) on white. In contrast, this green piece has a value of 5 (slightly powerful) on green. But it has a value of 4 (slightly weak) on white. 3 Hint: a triangle has 3 sides. 4 Hint: a square has 4 sides. If the color of the symbol matches the color of the board space or section, then the value of the piece is the corresponding number. These values range from 0 to 4. On the other hand, if the color of the background of the piece matches the board space or section, then the value of the piece is the opposite, or 9 minus the number. These values range from 5 to 9. The higher numbers indicate higher value. A blue piece with an equal sign on its face (a tackle) is equal in value to any opposing piece. A blue piece with a triangle on its face (a ranger) has a fixed value of 3. When a piece is making a hostile overture, its value is determined by the space to which it is moving, not the space from which it is moving.